What is a "moneyline" bet? 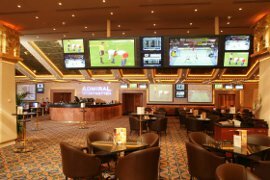 While seasoned gamblers understand the money line, many sports bettors do not understand this betting option and the huge potential benefits associated with using it. This article will describe the money-line and how it can be used to risk a little and win a lot in the NFL. Playing the Money Line is equivalent to picking a team (favorite or underdog) to win the game straight-up. Unlike my nfl picks against the spread, for this type of bet, there is no spread. If the team you pick wins the game outright, you win your bet. If the team loses, you lose the bet. And there is no juice or vig (although the odds you get have casino profit built in). For this game, the sports book has set the Money Line at -180 for Miami and +150 for Minnesota. That means that if you want to bet Miami to win straight up, you would need to lay $180 to win $100. If you want to take Minnesota to win straight-up, you would lay $100 to win $150. For the second game, the bookmaker has set the money at -300 for the Pack and +230 for Buffalo. The larger numbers reflect the larger spread. If you can pick a 6.5 point underdog to win straight-up, you would win $230 for a mere $100 bet. What you may have noticed is that if you can successfully pick underdogs to win straight-up, you can win a lot of money without risking nearly as much. I like this fact about the money line. And, if you combine money-line picks into parlays, you can really hit the jackpot with a small investment. For example, if we parlayed Minnesota and Buffalo with the money-line in the above example, a $100 bet would yield $725 in winnings. Throw in a third team (say, the Giants at +4.5) and a $100 bet would win $2,169. Obviously, it is harder to pick underdogs to win straight-up, right? Yes, but maybe not as hard as you initially think. The spread only comes into play about 84% of the time in the NFL. In other words, the team that wins the game doesn't cover the spread only 16% of the time. For example, let's imagine over the course of the season you were to pick 100 three-point underdogs to win straight-up at a money line of +150. In this scenario, you would only need to win 40% of those games to break even. On the 60 losses, you would of course lose 60 units (there is no juice on money line bets). On the 40 winners you would win 60 units (1.5 x 40). If you were to pick one hundred 6.5-point underdogs to win straight-up at a money line of +230, you would only need to win about 31% of your bets to break-even. So, there is an opportunity to do well with the money-line if you can select enough dogs that win straight-up. This season, consider using the money line to your advantage. If you like an underdog and think they have a shot at winning the game outright, you might be better off putting that $100 on money-line for your team. If they win straight-up, you'll rake in a lot more profits than if you had just bet them to cover the spread. If you aren't sure, split your bets and put $50 on the dog to win straight-up and $50 to cover the spread. If the team covers the spread but doesn't win the game, you break-even. If they win the game, you win both bets! What do these numbers mean? They represent the "money-line" and they are used as a way to take into account that some teams are better than others. If both teams in a contest were exactly evenly matched and there was no profit for the sportsbook, then you could simply bet $100 on either team, and if they won, you'd get paid $100. If they lost, you'd lose your $100. In this case, NY is a favorite and Colorado is an underdog. If you want to bet with the Yankees, you need to bet (risk) $250 to win $100. So, if you bet $250 on the Yankees to win the game, you'd win $100 if they actually won and you'd lose your $250 if they lost. On the other hand, if you liked the Rockies to win, you'd bet $100 to win $220. If you lost, you'd lose your $100 but if you won, you'd win $220 for your $100 bet. Why don't you get +$250 on Colorado? The $30 is the sportsbook's profit. Because of these numbers, many bettors don't like to bet big favorites and prefer to stay with low-priced favorites or underdogs. If you want to play big favorites with better odds and less risk, my free parlay picks could be a great option for you. I also incorporate moneyline bets into my expert sports picks, so if you're looking for some new betting strategies, check out one of my sports picks packages.